Japan explorations for the culturally curious. If you plan to raise financing, start a kabushiki kaisha (KK). If you want to have a partner that helps you run a business, start a KK. If you will be working with established Japanese companies, start a KK. If you want to keep it super simple and set up quickly, start a godo kaisha (GK). If you already have an entity in another country and are looking to work with Japanese clients, start a subsidiary. A good breakdown of the differences between GK and KK is in this article from TA Lawyers GKJ. Because I wasn’t planning on taking outside financing, building a board, or having a branch in America, I ended up establishing a godo kaisha. I also had to get a signature certificate since I wasn’t registered in Japan and didn’t have an inkan (a registered stamp that acts as your official signature on important documents), so I went to the US Embassy and signed a paper for them to notarize. Weirdly, I was nervous. I had heard about the Japanese being SUPER strict with signatures and making sure they are exactly the same every time. My personal signature has changed dramatically over the years and is a little different each day. So when I went to sign I actually messed up, and they had to start over again, which made me feel really suspicious, but I pulled myself together and got it right the second time around. Phew! You can download the “blank signature certificate” from the US Embassy Website. Breakdown of different company types and quick recommendations based on questions. Representative vs. branch vs. subsidiary. 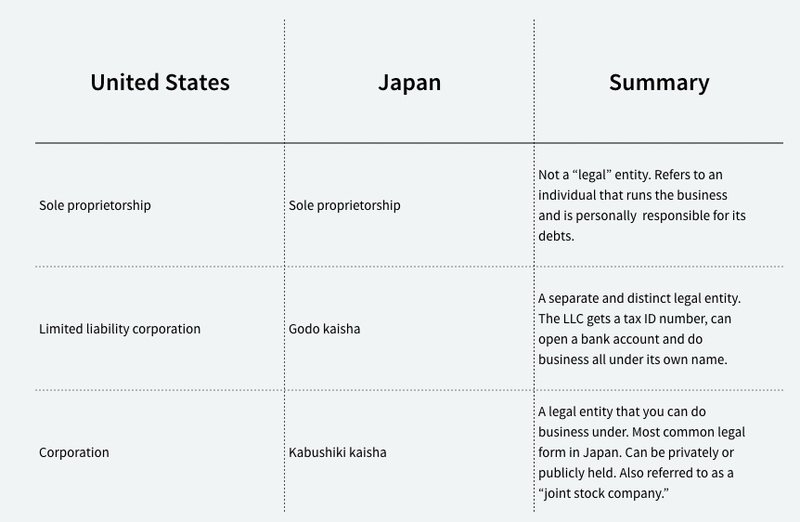 More information on sole proprietors in Japan. Explanation of the capital requirements for different companies. Another look at godo kaisha vs kabushiki kaisha. Companies: Miss Grand Japan and Intergo - Miss Grand Japan focused on beauty pageants and Intergo on translation services. Josh studied Japanese in college and had always had his sights set on moving to Japan. After graduation, he moved and spent a little over five years working in Japan as a translator, English teacher, and entrepreneur. He is currently back in America, but the companies he started in Japan are thriving. Josh decided to start a KK largely because he was going to be working with other Japanese companies and they prefer to interface with KKs. He had learned that historically there were more requirements to start a KK, meaning the founders needed to be more serious, legitimate, and committed. He also knew that GKs had been easy to set up, sometimes resulting in less reliable entrepreneurs. Times have changed and the regulations required are different, but the reputations remain. Keep this in mind if you will be working with government entities or Japanese companies that have been around for a long time. Incorporation cost about 2,000 USD plus a small initial investment. Josh worked with an advisor supplied by his investor to handle the paperwork. The hardest part for Josh and his business partner was picking the name for the company, everything else was relatively straightforward.